Francisco Ugarte, Self-Portrait (Drawing), 2012. graphite and charcoal on paper. 57.09 x 43.31 inches (145 x 110 cm). Courtesy of the artist and Curro & Poncho Gallery, México. 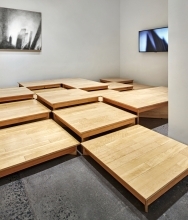 Elise Ferguson, Counterclock, 2015. pigmented plaster on MDF. 24 x 18 inches (61 x 45.7 cm). Courtesy of the artist and Romer Young Gallery. 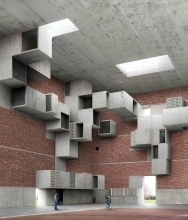 Filip Dujardin, Untitled from series Fictions, 2010. Edition 5 of 10. inkjet print on archival pearl paper, printed 2015. 43.3 x 43.3 inches (110 x 110 cm). 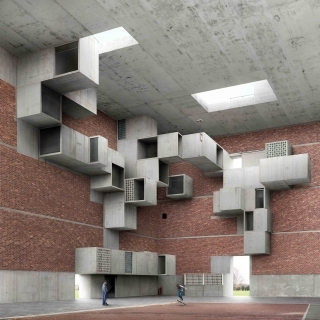 © Filip Dujardin / Galerie van der Mieden. 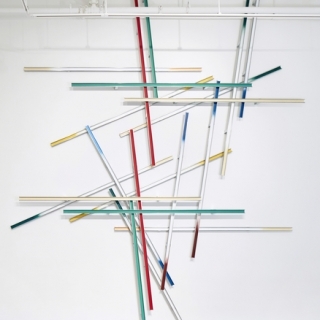 Aziz + Cucher, Time of the Empress Series, 2012. HD video. infinite loop. Courtesy of the artists. 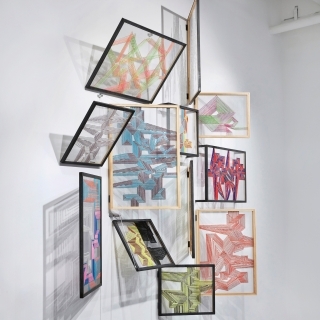 Alois Kronschlaeger, Grid Structure #1: Configuration #4, 2015. basswood, mesh and ink. 95 1/4 x 50 3/4 x 51 5/8 inches (241.9 x 128.9 x 131.1 cm). Photo John Muggenborg. Carmen Herrera, Untitled, 2012. acrylic and pencil on paper. 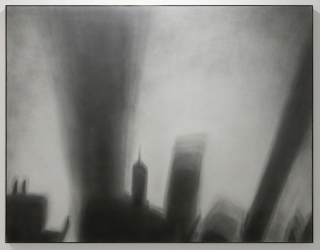 27.6 x 39.4 inches (70 x 100 cm). 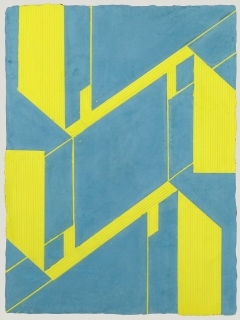 Framed: 30.5 x 42.3 x 1.8 inches (77.5 x 107.5 x 4.5 cm). 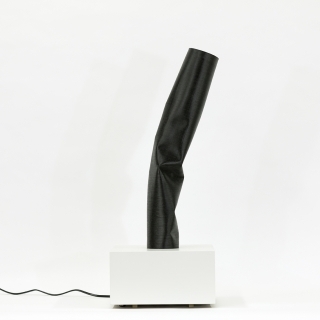 Courtesy of the artist and Lisson Gallery, London, Milan and New York. 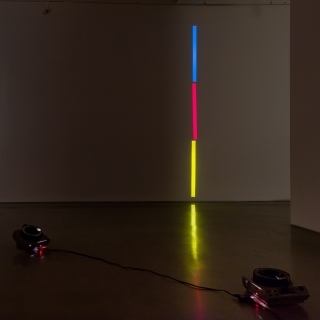 Barbara Kasten, Shadow=Light, 2010. digital video. 2 minutes 24 seconds. Courtesy of the artist and Bortolami, New York. Richard Galpin, Black Mirror, 4x1, no. 4, 2014. sanded and varnished photograph. 60.59 x 47.28 inches (153.9 x 120.1 cm). 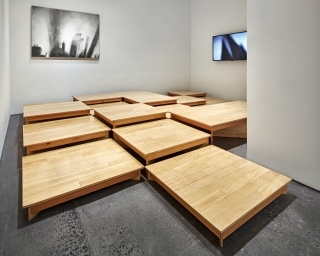 Jennifer Marman + Daniel Borins, Floor 1-25, 2000. mixed media (laminate flooring, plywood, rubber). dimensions variable. Jean Shin, Carte Blanche Constructions, 2001. blank rolodex cards. Dimensions variable. 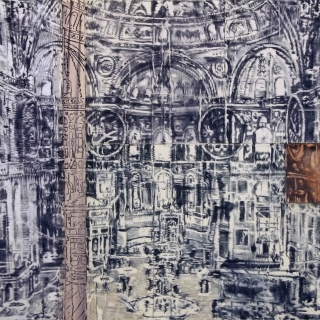 Francisco Ugarte, Intervention at Polyforum Siqueiros (Drawing), 2013. sketch paper, black, orange and blue markers. 40.16 x 28.74 inches (102 x 73 cm). Courtesy of the artist and talcual, Mexico D.F. 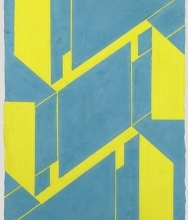 Jorge Tacla, Camouflage 102, 2012. oil and cold wax on canvas. 60 x 60 inches (152.4 x 152.4 cm).